If your pipes are clogged in or near La Grange call you drain cleaning professionals at 708-246-3658 today! Have you experienced a constant clogging in your shower or bath? While this can be the sign of a more serious problem, it may also be something that can easily be repaired. Clogging causes from many different things. The most common clog in a shower or bath tub is from excess hair build up and can often be treated with a good drain cleaner. Many times the clog is more severe and you need a plumber to rod out the actual drain itself. 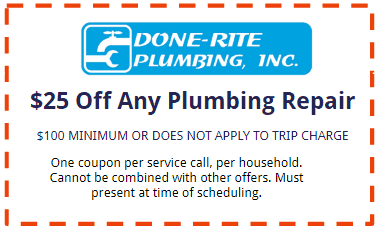 For professional drain cleaning services near La Grange, count on Done-Rite Plumbing. Many people tend to ignore when their drain begins slowing down. While it’s easy to ignore the problem, these clogs begin building and may lead to more complicated issues such as leaks or severe backup. Some people turn to toxic commercial drain clearing products to solve their issues. What many people may not realize is that a persistently slow drains could be a sign of a much more serious issue which may require a professional drain cleaning service. At Ability Plumbing, we will provide you with one of our professional plumbers to resolve your drainage problems from the root. Children’s Toys– Many kids play with their toys in the bathroom and sometimes let’s face it, kids get clumsy. Dropping a toy in the toilet, bath or sink can cause a real hick up. Jewelry– Adults can have the misfortune of dropping their jewelry down the drain and if the water is not running to strongly, we may be able to help recover lost jewelry. The trick is to stop the drain and turn off the water right away and call Done-Rite Plumbing. Hair– Hair is one of the most common causes, especially in showers or baths. Long hair build up happens often and as hair gets trapped in drains, it builds up drains causing water to back up. Excessive Toilet Paper & Feminine Products– Excessive toilet paper, baby wipes or feminine products can cause drains to clog, so we recommend it’s best to avoid flushing baby wipes tissue, or feminine products down the drain. Food– Food is one of the biggest culprits in a kitchen as many people scrape excess food down the drain while washing dishes or rinsing food plates. Excessive build up can lead to a clog over time. A good garbage disposal can prevent many kitchen sinks from clogging. Done-Rite can install or repair a garbage disposal in your house. We only carry the best of the best, so call us today! As a drain clogs, water continuously slows and leads to a sudden clog. While you may not have a clogged drain, you may notice foul odors may be the sign of tree roots entering your drain or you may even notice gurgling noises in your plumbing, low water pressure, and water leaks resulting from cracks in the plumbing. If you notice a clog in your home or office, the best thing to do is to call Done-Rite Plumbing to prevent further damage. Our plumbing technicians will come out an diagnose your clog and remove unwanted items causing your drain to clog. Our licensed plumbers will use treatments such as plunging, rodding, or even use high pressure water jets through your pipes. Sometimes the severe tree roots may require sewer repair in your parcel. Call Done-Rite Plumbing in La Grange, IL for help with your drain cleaning solutions at (708) 246-3658 today!